Semi-Organic Growth presents a unique analysis of Google's distinctive expertise in the area of mergers and acquisitions, derived from more than 150 acquisitions carried out over the company's short history. 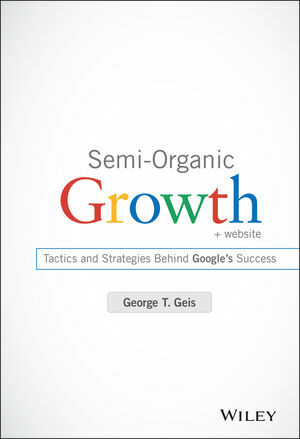 While organizational growth has traditionally been characterized as organic (internally generated) or inorganic (from acquisition), this book examines Google's semi-organic strategy for accelerating product and service revenue, explained through a unique sector/subsector classification scheme that dynamically maps the media, Internet, and technology platform markets. You'll gain insight into Google's disclosure strategies for private company transactions, and more importantly, their methods for integrating acquisitions into product and service offerings to achieve ecosystem synergy. Unique perspective reveals the lessons learned along the way from both successes and failures, and the companion website gives you access to the tools that help you implement what you've learned. Google's extensive use of M&A as a growth strategy has been in sharp contrast to the practices of rivals like Apple, and further contrasts with the failures of many other companies in corporate business development. This book shows you the thinking behind the company's successful methods, and demonstrates the mechanisms behind the success. Google is an iconic, premiere company, and it didn't happen by accident. Their success is driven by their innovative approach to strategy in all areas, and their M&A expertise has been a major contributing factor. Semi-Organic Growth takes you through the core workings of Google M&A to provide insight into successful strategy for the modern market. GEORGE T. GEIS teaches at UCLA Anderson in the areas of corporate business development and entrepreneurship. He has been voted Outstanding Teacher of the Year at UCLA Anderson five times. Currently, he is faculty director of Anderson's Mergers and Acquisitions Executive program. Geis has also taught mergers and acquisitions at the Haas School, University of California, Berkeley.